President Bill Gile opened the meeting by reading the six objects of Kiwanis. He then reviewed the meeting schedule for the rest of the year. November 27th will be a combination Board meeting and business meeting. He also noted, there will be only one meeting in December. It will be on December 11th and is our annual Yankee Swap. Bill canvassed the group and it was decided the Kiwanis Club will NOT be participating in the holiday parade this year. Also it was noted, Larry Frates approached Scott Laurent to determine if there was any Club interest in partnering with him in the parade. Larry and his group will be ringing Christmas Bells for the Belknap Mill. None of the members chimed in on that idea. President Bill also stated that the concession stand that the Key Club ran with assistance from the Kiwanis Club during the soccer tournament was a big success, although the take was a bit below last years. All the receipts are not yet in but the Key Club cleared well over $2,000. 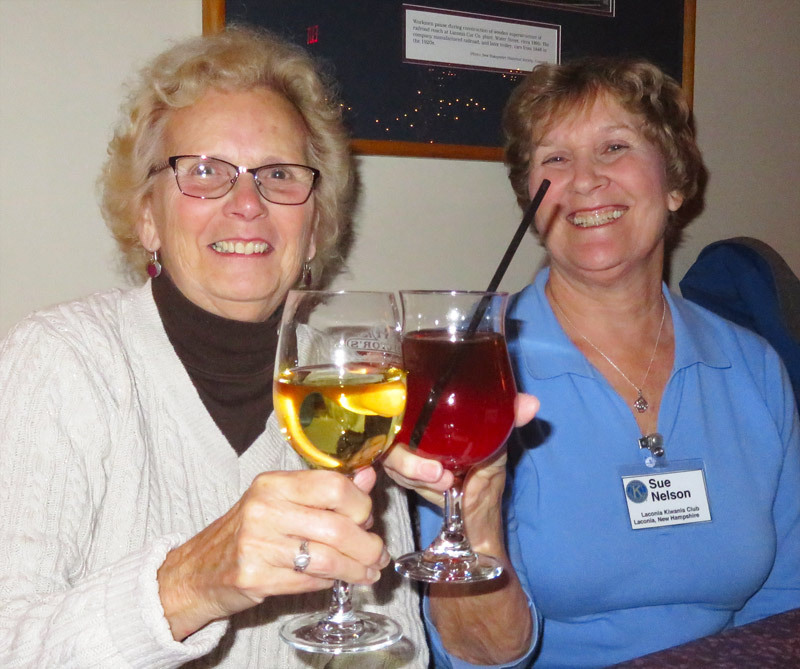 The Kiwanis Club donated water and soda for sale. Bill also noted, the homeless awareness event netted well over $200 in donations. John was honored to present former 30-year member Joe Adrignola with a Legion of Honor award for 30 years of membership. 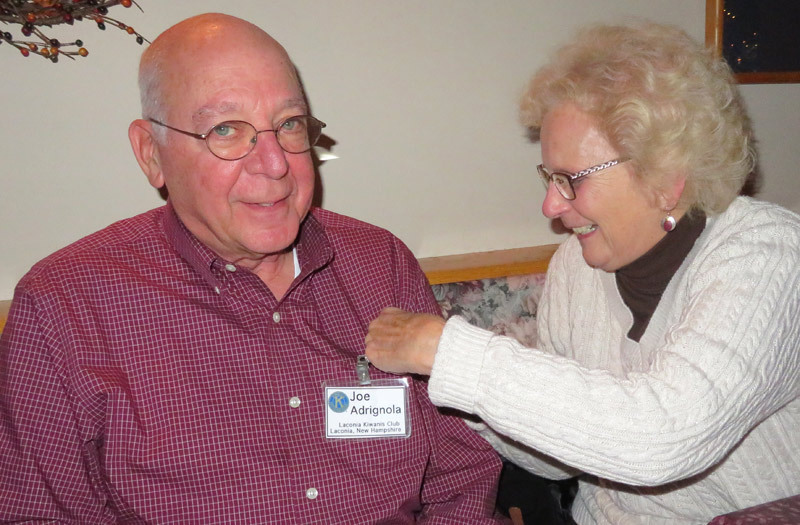 Vi was asked to pin on a new Kiwanis pin that saluted Joe for 30 years of membership and the fact that he is a past president as well. John noted that Joe is also a two-time winner of the Kiwanian of the Year Award. Thank you, Joe for your many years of service! Joe gets pinned by Vi. 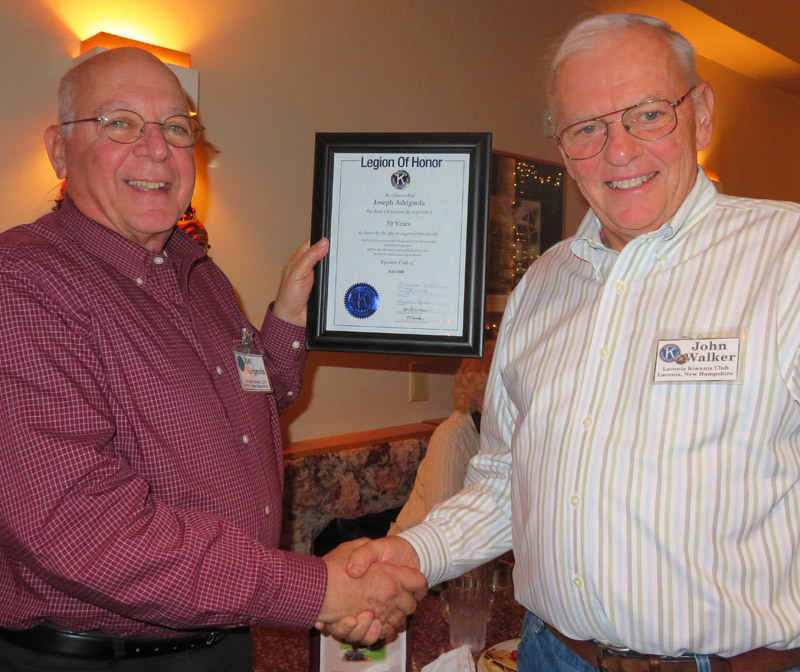 Past President Joe (1993-1994) is congratulated by Past President John (2014-2016). $1 from Sue Nelson for her and Don's imminent departure for a warmer climate. 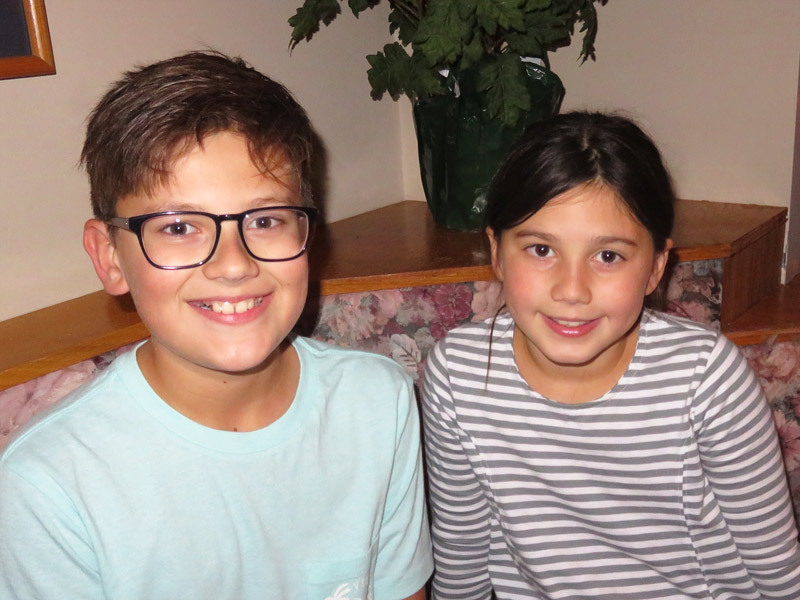 $4 from John Walker: $3 for our special guests Clare, Mike, and Eric and $1 for the success of Muff's children's book. 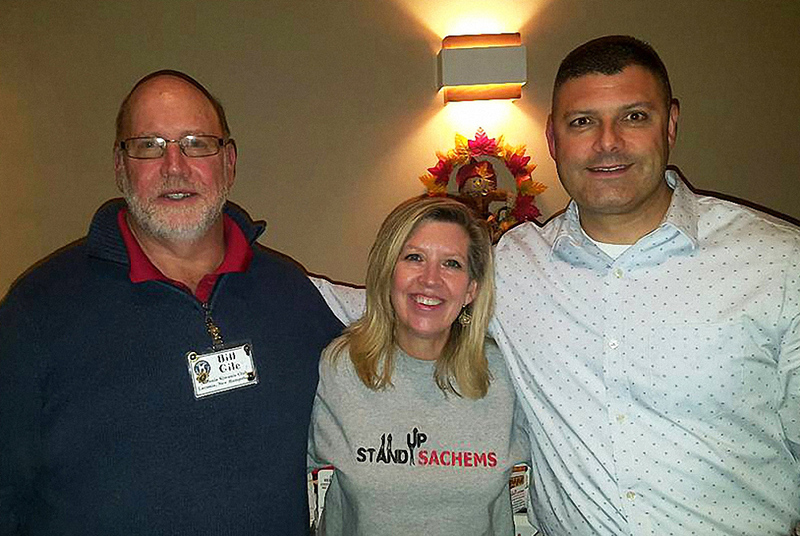 Our guest speakers were Clare Persson, Chairperson of Stand Up Laconia and Eric Adams, Prevention Enforcement Treatment (PET) Officer from the Laconia Police Department. Eric is also a member of Stand Up Laconia. The mission of Stand Up Laconia is to stand up to effectively and compassionately confront the consequences of substance misuse by advocating for prevention, intervention, treatment and recovery. 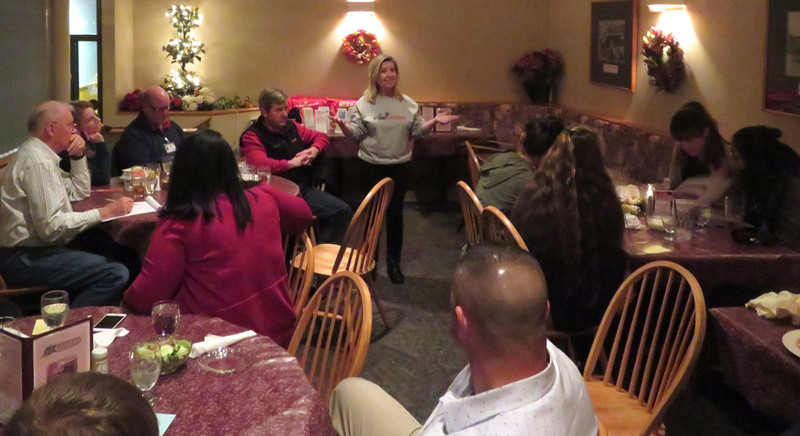 Clare Persson discussed the history of the Stand Up Laconia program since inception in 2011 at a Middle School PTO meeting. Clare provided handouts, a notebook maintained since 2011, and details of the organization. Clare Persson was pleased to explain the goals and objectives of Stand Up Laconia. 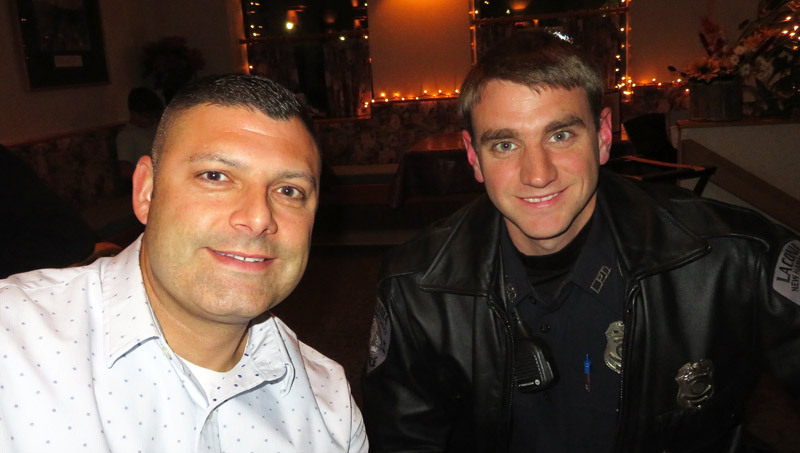 Eric Adams covered the chief drugs in the overdose epidemic (alcohol, fentanyl and heroin) and discussed the parameters of his job as Prevention Enforcement Treatment (PET) Officer with the Laconia Police Department. He was pleased to note that the success rate of folks who remain in a recovery program for at least 90 days is between 68-69%. Eric Adams reports on his job as Prevention Enforcement Treatment Officer. 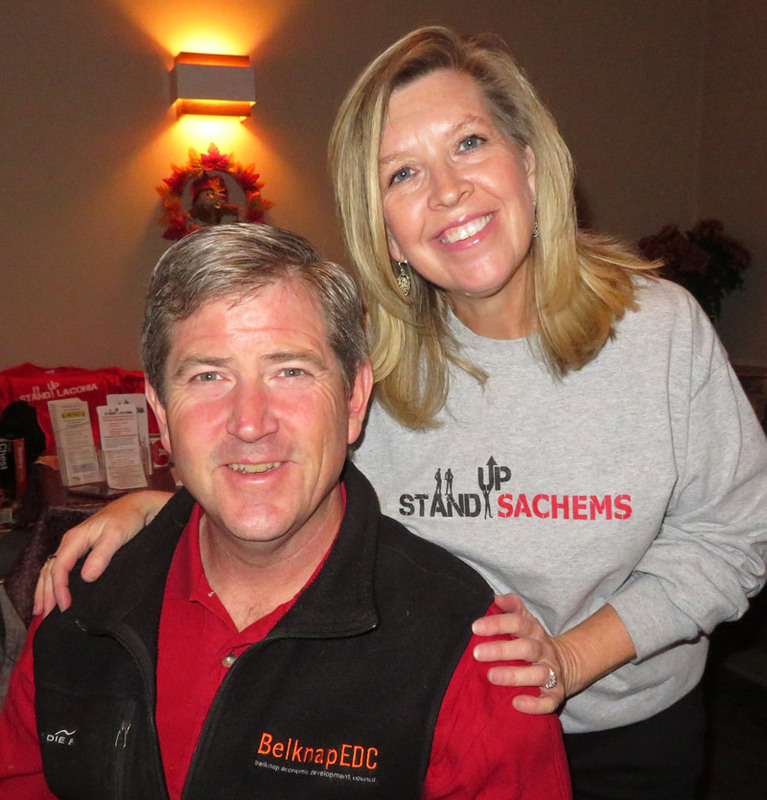 For more information on Stand Up Laconia, “click” here. 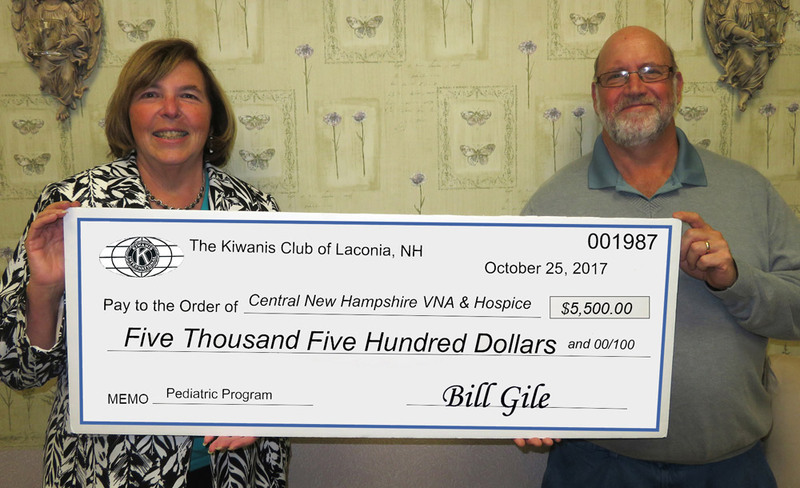 The Laconia Kiwanis Club recently donated $5,500 to Central NH VNA & Hospice. 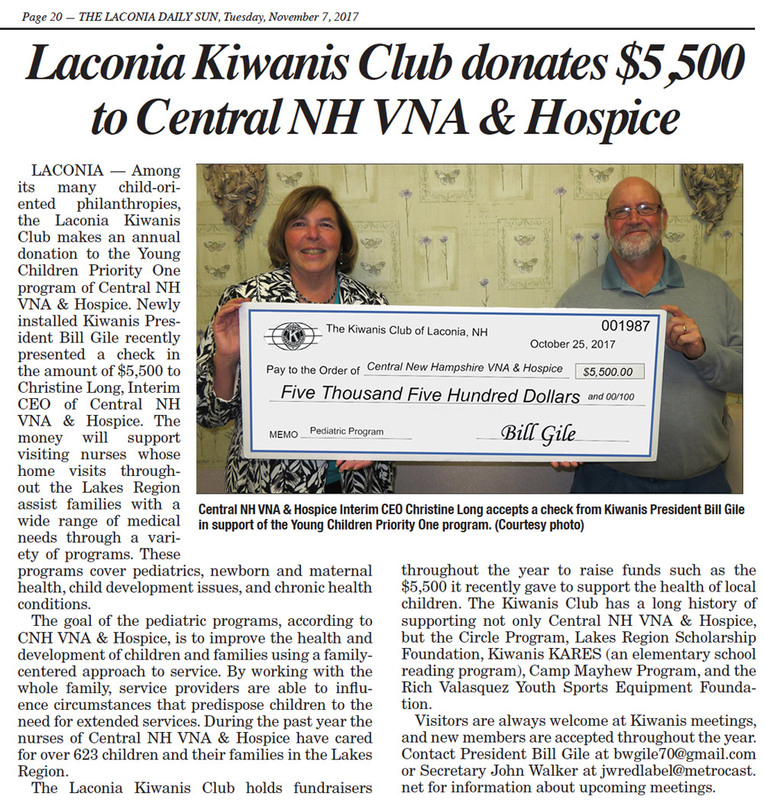 To read the story that appeared in The Laconia Daily Sun on 11/7/17, "click" on the picture below.